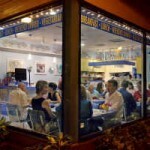 Nestled in a strip plaza off bustling Tampa Road is a very different type of restaurant. Not only does it feature fresh vegetarian cuisine, but its owner and staff are working to promote peace and inspire the community, one serving at a time. 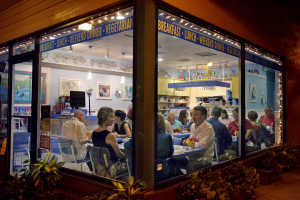 (PHOTO BY DOUGLAS R. CLIFFORD | TIMES) Guests of Tilvila Hurwit, owner of Consciousness Blossoms, enjoy a special dinner Sunday at the Palm Harbor restaurant as part of its 10th anniversary celebration. Consciousness Blossoms opened 10 years ago this month and in these tough economic times, when many larger restaurants are closing their doors, regular customers still flock to this eatery as much for the people who run it as for the food itself. “It’s very serene and peaceful here,” said Judith Ann Pattison, 61, at a dinner honoring loyal customers and local volunteers at the restaurant Sunday. Pattison and her husband, Peter, 62, travel from south Clearwater sometimes as often as three times a week to enjoy breakfast or lunch at Consciousness Blossoms. “I just like the fact that the servers are beautiful people and they make you feel like family,” Judith Ann Pattison said. Owner Tilvila Hurwit, 50, knew nothing about running a restaurant when she opened Consciousness Blossoms in 1999, but she did know she wanted it to be an oasis for the body and soul. 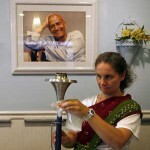 The restaurant is inspired by the late Indian spiritual teacher Sri Chinmoy, whose portrait hangs on the wall and whose music plays in the background. 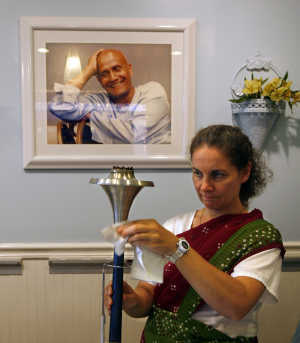 (PHOTO BY DOUGLAS R. CLIFFORD | TIMES) Terri Carr of Clearwater buffs a torch used in the World Harmony Run, which strives to create goodwill and understanding among nations around the world. The Pattisons like the selection of different Chinmoy quotes printed on business cards displayed on each table. “We like to shuffle the cards and then pick one and it’s our message for the day,” Peter Pattison said. The five women who work at the restaurant participate annually in the World Harmony Run, an event started by Chinmoy in 1987. The global torch relay and other community events celebrate peace and advocate for a more harmonious world. They decided to take the effort one step further this year by honoring three local volunteers with the “Torch Bearer” awards handed out Sunday. “We wanted to help celebrate the restaurant by celebrating the community members who have been so selfless in helping others,” Hurwit said. One of the awards was given to Betsie Hughes, 17, an East Lake High School student who had a stroke before birth and walks with a limp. But she does not let her disability get in the way of helping others. She volunteers for several agencies in the community including the Red Cross, Countryside Library and a group at her school called the Invisible Children’s Club. 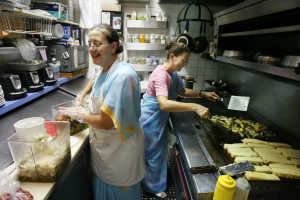 (PHOTO BY DOUGLAS R. CLIFFORD | TIMES) Linda Schloegel, left, and Hurwit, both of Safety Harbor, prepare the vegetarian dinner Sunday night. Pat Hayes, 71, of Palm Harbor and Meredith Chisholm, 70, of Clearwater also were honored for their work in helping survivors of domestic violence through the Haven of RCS in Clearwater. Hays spent 20 years working in human services. When she retired, she missed helping others. “I wanted to volunteer in a group that involved help and support,” she said. Hurwit said she and her staff plan to continue saluting community helpers by hosting the Torch Bearer Awards every year. She would like to hear other stories of unsung heroes and urges people to contact the restaurant if they know someone deserving of an award by calling (727) 725-0013.